Zion Market Research has published a new report titled “Human Microbiome Market by Product (Probiotics, Prebiotics, Medical Foods, Supplements, and Others), by Application (Therapeutics and Diagnostics) and by Disease Type (Obesity, Diabetes, Autoimmune Disorder, Metabolic & Gastrointestinal Disorders, Cancer, and Other Diseases): Global Industry Perspective, Comprehensive Analysis and Forecast, 2017 – 2024”. 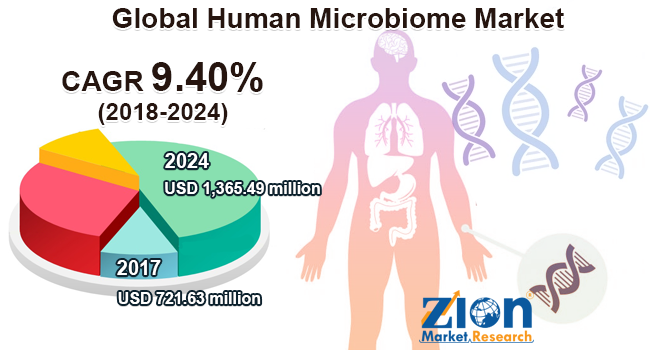 According to the report, global human microbiome market was valued at approximately USD 721.63 million in 2017 and is expected to generate revenue of around USD 1,365.49 million by the end of 2024, growing at a CAGR of around 9.40% between 2018 and 2024. The human microbiome is the genetic material of microbes such as bacteria, protozoa, viruses, and fungi which are present in or on a human body. The ratio of the number of the microbes and human cells is approximately 10:1. The bacteria in the microbiome helps to regulate our immune system, digest our food, protect against other bacteria, and produce vitamins which are necessary for body functioning. Due to these various benefits provided by human microbiome, there is an increase in the demand for global human microbiome market. Human microbiome market is segmented based on the product, application, and disease type. Based on products, the human microbiome market is further segmented into prebiotics, probiotics, medical foods, supplements, & others. Probiotics segment is anticipated to dominate the product segment of the human microbiome market. The growth in awareness about beneficial properties such as improvement in digestion helps in weight loss, reduction in risk of heart disease, etc. of probiotics is expected to fuel the growth of the probiotics segment. Based on application, the human microbiome market is further segmented into therapeutics application & diagnostics application. The increase in the need for reliable & precise medicines and increase in research yielding new applications and usage of the human microbiome is expected to fuel the growth of the therapeutic market. The human microbiome market is thus projected to incline towards therapeutic applications in near future. The disease type segment is further segmented into obesity, diabetes, an autoimmune disorder, metabolic & gastrointestinal disorders, cancer, & other diseases. Metabolic & gastrointestinal diseases segment is expected to dominate the market in the forecast period. The rise in awareness about the use of human microbiome in the treatment of metabolic & gastrointestinal diseases is expected to fuel the growth of the segment in the disease type segment. Europe, North America, Latin America, Asia Pacific, and the Middle East & Africa are the regional segments of the global market of the human microbiome. North America is anticipated to dominate the market in the forecast period due to the increase in the number of ongoing clinical trials and early adoption of recently developed technologies. Europe is the second most lucrative market after North America. The increase in the number of the aging population due to which there is an increase in the diseases & disorders is further fueling the growth of the European human microbiome market. In the forecast period, Asia Pacific is expected to follow North America and Europe due rise in a number of initiatives to develop human microbiome & the rise in government funding for development of precision medicine. Also, the increase in a number of various companies for the investment in this region is expected to fuel the growth of the human microbiome market. Latin America & the Middle East & Africa is expected to show slow growth rate in the forecast period. The rise in awareness about the use of the human microbiome is mainly anticipated to fuel the growth of the human microbiome market in these regions. The main players involved in the global human microbiome market are AOBiome LLC, Second Genome, Seres Therapeutics, Osel, Inc., Metabiomics Corp., uBiome, Inc., Rebiotix, Inc., Enterome Biosciences, Vedanta Biosciences, and Synthetic Biologics, Inc. The major companies focus on developing new solutions & products by entering into partnership or through acquisition. In 2016, Monsanto collaborated with Second Genome to use microbiome technology platform to accelerate protein discovery.